waterfalls and romantic coves, remains one of Jamaica’s jewels. A walk through its streets is like taking steps back in time ­ tranquil but with a hint of previous activity, past glory and future promise. 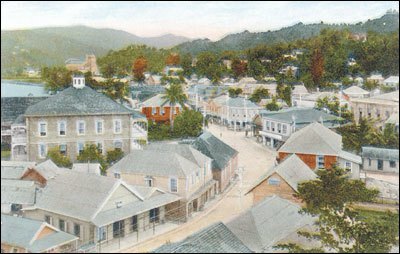 The Town of Port Antonio in the late 1800s. 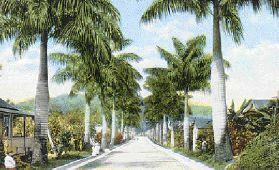 IN THE 1940s and 50s, the parish of Portland, and in particular the town of Port Antonio, was the setting of numerous Hollywood films and a favourite destination of many Hollywood stars including Errol Flynn, (who called Port Antonio heaven on earth and once owned nearby Navy Island after winning it in a game of poker, craps or dominoes) Clara Bow, Rudyard Kipling and Ginger Rogers. It is said that Errol Flynn was so in love with the area he claimed he never met a woman as beautiful as Port Antonio. Robin Moore, the author of The French Connection, is said to have written the famous novel while sitting under a mango tree in Port Antonio. Many feel that Port Antonio’s relative underdevelopment compared to the island’s other resort towns, gives it a special charm. 1915: Man carrying bananas to a ship. estates and more than 100 cattle pens and small holdings. Portland’s fortunes were to take a turn for the better in the late 19th century with the development of the banana industry. Portland’s soil and heavy rains were well-suited to banana cultivation and almost any size farmer could grow banana for profit. Banana, a quick growing crop that can be ready to reap within a year, also had another advantage over sugar, it can be harvested throughout the year. Lorenzo Dow Baker, the man credited with single-handedly jumpstarting banana production for export on the island, arrived in Jamaica in 1870. The island was experiencing a decline in sugar production and increased competition from beet sugar. Its protected market was gone. A new export crop was needed. Baker turned popular attention to the banana, long regarded as a source of local food, particularly for black Jamaicans ­ slaves had been its main cultivators in their provision grounds. Famed botanist Sir Hans Sloane (who founded the British Museum) noted the existence of bananas in Jamaica from as far back as 1688. Baker, who owned an 85-tonne sailing ship, decided the market was big enough for him to play a part. His first Jamaican cargo included coconuts, coffee, pimento, bananas and bamboo ­ all of which sold quickly after the 2-week trip. Baker, not one to let opportunity pass him by, saw the two-way potential of this tropical trade and he loaded up with flour, pork, cured meats, codfish, herring, boots, shoes, furniture and textiles and returned to Jamaica. It was on this second visit that he landed in Port Antonio where he sold some of this cargo. He used the profit to purchase a cargo of bananas at 25 cents/bunch. He eventually left Port Antonio with some 450 bunches of banana. Baker encouraged Jamaicans to plant banana with the challenge, “the first man who has ten acre of bananas will be rich!” Baker’s Jamaican bananas were then sold in Boston for US$2.50 each! In 1879 Baker became the agent for a newly formed shipping company that enabled him to expand his transportation of bananas. of 5 trips a year. 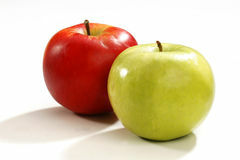 He formed the Boston Fruit Company by buying out smaller concerns. Small farmers began to buy and rent land all over the parish to plant banana. Baker expanded by buying estates (including Bog, near Port Antonio and Bowden in Port Morant), more ships and building piers. He soon faced increased competition, especially from the Keith and Lindo families who were engaged in a thriving fruit trade from Costa Rica to New York. In 1885, after buying out some of his competitors (including the Keith interests) his enterprise became known as the United Fruit Company. 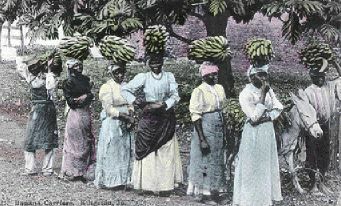 By 1902 Baker controlled the entire island’s banana trade (St. Mary had also emerged as a major producer of bananas) and he went on to supply fruit all along the east coast of the United States and later, New Orleans, Montreal and London. Regular exports to Britain had begun in 1901 with Sir Alfred Jones’s Imperial Direct Steam Line (which included refrigerated machinery) employed to the United Fruit Company and later bought out by them. Some 650 tonnes of banana were shipped to the UK each month. As Baker’s trade grew, Port Antonio became the second most important town in Jamaica. Most of his workers lived in Portland. Those who did not grow bananas, reaped them or loaded them onto ships, earning some 70 cents per day. Money was new to the people of Portland and it is said that some became so rich that they used five-pound notes to light their cigarettes. Knowledge of saving was sadly lacking. became known for its afternoon tea on the piazza and bathing in bath houses. One of Titchfield Hotel’s great claims to fame is that it was once owned by famous Hollywood swashbuckler Errol Flynn who died before he could put any of his plans to develop the hotel into place. In the late 1960s the hotel was destroyed by fire. Today only the ruins of this great landmark still stand. The banana industry peaked in 1936 with exports of 355,000 tonnes. In a few years, however, it went into decline. Today, the Jamaica Producers Group of Companies, along with the All Island Banana Growers Association, continues to serve the interests of the island’s banana farmers ­ an industry facing the repeal of protected trade agreements in the next 5 years. * The Port Authority of Jamaica’s (PAJ) development of a US$7-19 million marina in the West Harbour, which includes a security/marine post, an English style pub, a boardwalk and a boatyard aims to lift the parish’s tourist profile. * PAJ to develop Navy Island to include luxury villas, shops, a hotel and restaurant. * Ken Jones Aerodrome runway is earmarked for extension. * Future plans may involve more architectural restoration, the establishment of a museum and the transfer of Titchfield High School to a larger school to be built at Folly. This entry was posted in History and tagged Port Antonio: A HISTORIC PORTRAIT OF THE TOWN WHERE JAMAICA'S TOURISM BEGAN. Bookmark the permalink. I’v never been to port antonio but I heard its one lovely parish. As a gateway to lush Portland parish, its laid-back attitude makes it a perfect destination for travelers seeking to get away from it all.